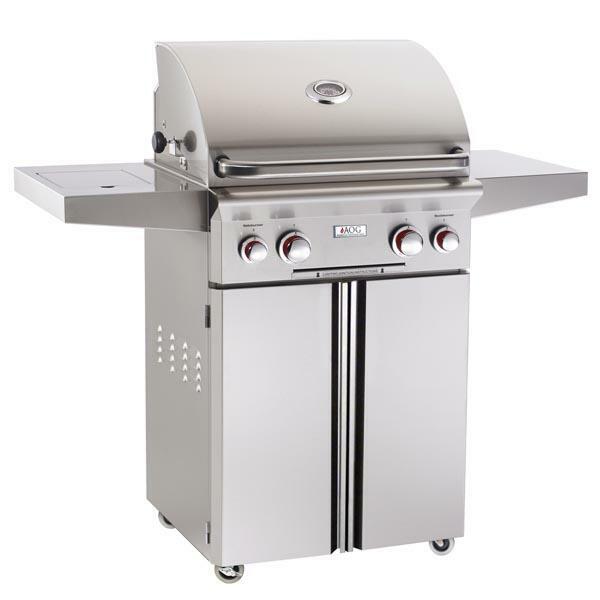 The T Series of grills by American Outdoor Grills feature a push-button piezo ignition system that makes this style of AOG more self-sufficient than any grill before it. It requires neither electricity nor batteries for the ignition. The AOG 24’’ T Series Portable Grill is made to run on liquid propane, but a natural gas conversion kit is available for purchase, should you prefer it. The 24PCT is the smallest in the T Series Portable Grill offering. It has a primary cooking surface of 432 square inches and features a primary surface, plus side and backburners. If you choose, you can elect to customize the grill to not include the side and back burners. AOG makes the T Series with functionality at the forefront, but style comes in a close second. The grill is made with stainless steel that is finished in a satin finish, and the head is rounded and contoured for forward-thinking style. Kick your outdoor kitchen up a notch with AOG! This item requires freight delivery. This shipping method uses a full size semi-truck and product can be delivered to a street side location or into a room of choice based on the level of service requested. A representative will call to schedule your delivery which will require a signature upon receipt. Most delivery times within the Continental U.S.A. range from 5-7 days on in stock merchandise. Special order products can ranges from 2-6 weeks depending on availability.